CubeDiction is sponsoring promising speedcubers. Daan is a real allround cuber. His ranking in almost all official events is in the top-10 of the Netherlands and with a few events we find him in the top-5. He is places 4th in sum of ranks. In 2018, he wants to improve mainly on 3x3x3 with one hand, on the blind parts and the common 3x3x3. CubeDiction is proud to be his sponsor. 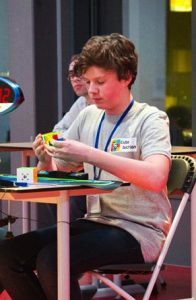 Robin has been competing in cube competitions since 2012 and has been the best Dutch speedcuber on the Pyraminx since September 2016. In the finals at the EC 2018 in Madrid, Robin very well on the 6th spot! 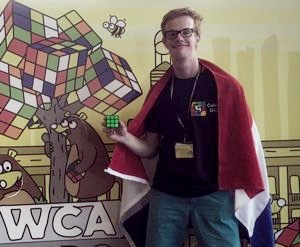 Mika is the current Dutch Champion speedcubing. In a thrilling final, he beat Mats Valk at the Dutch Championship in September 2019. So now Mika is Dutch Champion for a year. And not wrongly, this young speedcuber keeps improving himself. 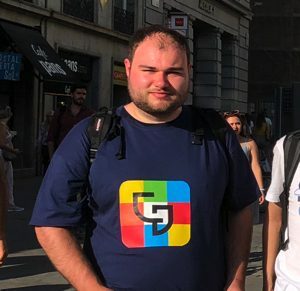 We are very proud he is wearing CubeDiction’s t-shirt. Being a sponsored speedcuber you will receive T-shirts with your name on the back and the CubeDiction logo on the front. In addition, you can order a products from our store for a fixed amount of money. This amount is agreed upon at the beginning of the year. In addition, you receive code for your friends and acquaintances. When this code is used for a purchase through our site, the buyer gets a 5% discount and you get 2% of the turnover, it is added to your credit for which you can buy cubes in our store. Right now we do not include new entrants in our sponsorship program, but keep an eye on the website for new possibilities.